​Animal Planet's Response to the World Cup? The World Pup. 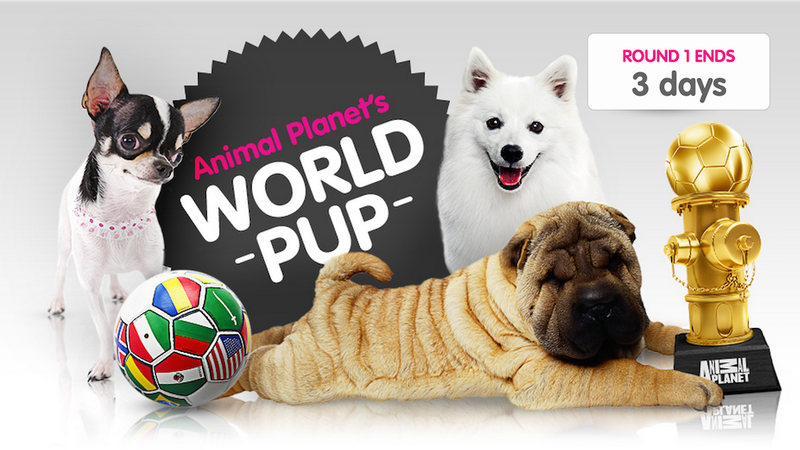 The dastardly geniuses who run Animal Planet have honed on the the only way America can secure a number one spot during World Cup a great idea—PUPPIES. That's right, Puppy Bowl rocked America's goddamn socks off in February, and now they're back to take full advantage of the world's biggest sporting event. And of course, they're calling it The World Pup. Har har. To find the top (read: cutest) dog, 16 breeds representing 16 countries will go head to head in a World Cup-style bracket based on watching informational but more importantly adorable puppy videos and voting. And the competition is pretty tough, if not totally lopsided. Team USA a.k.a.an Alaskan Malamute is crushing the French Bulldog but that just seems unfair, really. Meanwhile, Japan's Shiba Inu is dominating the Brussels Griffon. Honestly, it seems a bit unfair to pit meme-inspiring animals against lesser known, though very cute, breeds. I guess we should be thanking our stars that the Welsh Corgi is not even in this tournament because that would just be devastating for everyone involved.